Fabric 18 Yards Fabric for sofa only. 2.5 Yards Fabric for 2 Large pillows. 1.25 Yards Fabric for 2 Small Pillows. 0.5 Yards Fabric for center kidney pillow. 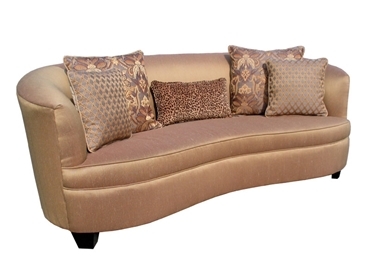 Options All sofas can mix only 2 fabrics on pillows. If you want a third fabric for the center pillow like the one shown in the picture there is an additional charge. Wood Finish Wood legs are available in a expresso color only.